Saint Paul de Vence is a beautiful village. Located in the sought after department of the Alpes-Maritimes, in coastal Provence, it occupies a scenic spot above a rocky precipice, making it one of France's famous "perched villages". Saint Paul de Vence is popular with tourists, who flock to walk its mediaeval streets and soak up the atmosphere. And it's a magnet for the rich and famous too, with celebrities like Bill Wyman of the Rolling Stones and philosopher Bernard-Henri Levy owning property there. Saint Paul de Vence is noted for being one of the south of France's best preserved mediaeval villages. The old ramparts are interesting and picturesque, and there are plenty of fountains, religious statues and other heritage features to discover. Everything about the village's cobbled streets and traditional houses takes you back to a long ago era. But it's not all about old buildings. There's a very lively arts and crafts scene in the village too. The streets are packed with arty shops and artisan workshops where you can purchase unique pieces. The village's position, on top of a rocky spur, gives outstanding views over the countryside. In the distance, in one direction you can see the gleaming white mountains of the Alps, while in the other direction you can see the Mediterranean Sea in all its turquoise glory. Arts and crafts shops can be beguiling, but they don't provide the essentials of life like bread and wine! Yes, you can buy wine, artisanal baked goods and local olive oils in the village, but they are on the expensive side! For general shopping, it's best to leave Saint Paul and head to nearby Cagnes sur Mer to a large supermarket where the prices are more representative of a normal life. However, the village does offer some great restaurants and bars to enjoy. And, it's a paradise for lovers of art galleries and museums. Being so close to the Mediterranean Sea in the Alpes-Maritimes means that you'll find lots of choice when it comes to ideas for days out. This region, being so experienced in pleasing tourists, offers all kinds of sports and leisure activities. You can enjoy swimming, sailing, jet skiing and scuba diving at the coast, or play golf on one of many good courses. Near to the village there are some lovely walking trails, or try a little mountain biking if you're feeling more energetic. Or, why not drive to Isola for a bit of skiing? It's only an hour away. When you've got the French Riviera and the Alps all within reach, there's no shortage of places to go. Do all the old favourites, of course, like Nice and Monaco, but spare time for the lesser known places too. The region has some glorious countryside and tiny, impossibly pretty villages. They're best discovered by accident, so hire a car and take a drive. With Nice's international airport offering flights to suit all pockets direct from the UK, it's really easy to get to the area. There's a TGV station in Nice too, for those who prefer rail travel. A local service will then take you to Cagnes sur Mer, from where you can get a bus to Saint Paul de Vence. Drivers can get to the village from the A8 motorway and from the D2 road. A place like Saint Paul de Vence is never going to offer cheap property. Prices in and near to this most desirable of locations starts at around 750,000 Euros and go up to... well, how much have you got? So if you do have a large budget and want a really exclusive property in one of France's most sought after locations, you really can't ignore Saint Paul de Vence. 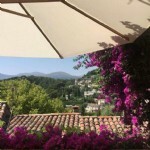 Do you know Saint Paul de Vence better than we do? Do you have photos of Saint Paul de Vence? WHERE IS Saint Paul de Vence? Saint Paul de Vence is situated in the south-east of France, in the south-west of the Alpes-Maritimes department, just a few kilometres inland from the Mediterranean. Access: By air: Fly to Nice with a variety of airlines. By rail: Take the TGV to Nice and continue by local service to Cagnes sur Mer. By road: The village is found near to the A8, just off the D2. Economy: The economy is mainly based around tourism and arts and crafts. Interesting fact: Saint Paul de Vence is a "perched village", sitting as it does on a rocky precipice.